Beclomethasone Nasal Spray is used in the prevention and treatment of common symptoms of allergic rhinitis, including hayfever and other airborne allergies, such as sneezing, blocked nose and runny or itchy nose and eyes. Hayfever Relief Nasal Spray contains the same active ingredient as Beconase nasal spray which retails for £8.99 in chemists and supermarkets. 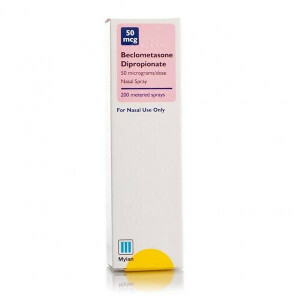 How to use Beclometasone Nasal Spray: Adults and children aged18 and over: The usual starting dose istwo sprays into each nostriltwice a day. The most you would take in a 24 hour period is normally 8 sprays (4 sprays per nostril). As your symptoms become better, your doctor may advise you to use a lower dose ofone spray into each nostriltwice a day.If you also have itchy, watery eyes you should tell your doctor. He may give you an extra medicine to treat your eyes. Be careful not to confuse them, particularly if the other medicine is eye drops. If your symptoms get worse again your dose may be increased back again to the starting dose. Tell your doctor before starting to take Hayfever Relief Nasal Spray:if you are pregnant (or intending to become pregnant)if you are breast-feeding a babyif you have recently been treated with injected steroids or if you have been taking oral steroids for a long timeif you have ever had to stop taking this or another medicine for this illness because you were allergic to it or it caused problems. Sometimes this medicine may not be suitable and your doctor may want to give you something different. Make sure that your doctor knows what other medicines you are taking, including those you have bought from the chemist. Remember to take this medicine with you if you have to go into hospital.You should carefully read all product packaging and labels prior to useHayfever Relief Nasal Spray contains:Hayfever Relief Nasal Spray is an aqueous nasal spray containing 50 micrograms beclomethasone dipropionate per spray.Hayfever Relief Nasal Spray does not cause drowsiness and does not affect your ability to drive or use machinery. You can still drink alcohol while you are using Hayfever Relief Nasal Spray.Like all medicines, Hayfever Relief Nasal Spray can have side effects. If you experience any of the following while you are taking Hayfever Relief Nasal Spray, tell your doctor as soon as possible.